The Bourne Legacy, the fourth film in the increasingly inaccurately named ‘Bourne Trilogy’, had a difficult birth. The Bourne Ultimatum, with its opening sequence featuring the assassination of a fictional Guardian reporter in Waterloo Station, filmed amongst the real life public, came out in 2007. Paul Greengrass, who directed Ultimatum, and The Bourne Supremacy (2004) (taking over from Doug Liman who directed The Bourne Identity (2002)), parted company with the franchise in 2009, citing creative differences with the studio, Universal, after they had commissioned two scripts for the next film without consulting him. Matt Damon followed him out of the door. Universal then hired Tony Gilroy who had written all three of the previous films, to write and direct Legacy. Without Matt Damon, the studio and Gilroy had to decide whether to recast Jason Bourne, in a Bond-like fashion, or to spin off in a different direction. Gilroy chose the latter, to run the Bourne Legacy story in parallel time to Ultimatum, giving the new hero, Aaron Cross (Jeremy Renner) the same US intelligence enemy, and a story that echoes Bourne’s story, with some new bells and whistles – Cross is chemically enhanced to be stronger and smarter than he was before, but without a constant diet of the wonder drugs supplied by “Outcome” the covert programme he is a part of, he will revert to his previous, very ordinary state. Which might not matter if the bad guys weren’t out to obliterate every trace of Outcome, so as to cover their tracks on the “Treadstone” and “Blackbriar” programmes familiar from the previous films. Cross needs those drugs to keep his edge. The parallel time device is very loose; the story starts with the big Waterloo station scene from The Bourne Ultimatum; Jason Bourne is referenced in news clips; Pamela Landy (Joan Allen), the CIA middle manager with a conscience who brought Jason Bourne home, appears at the end. 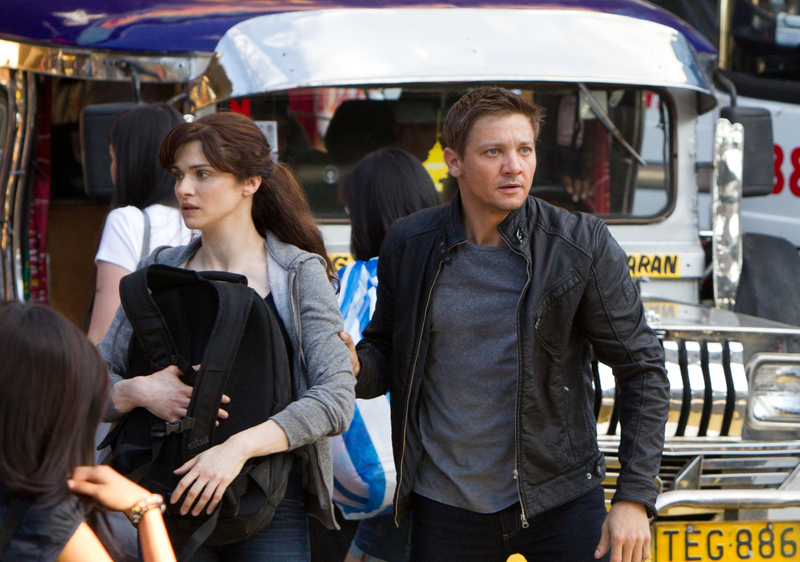 The Bourne Legacy has a slow start. There’s a lot of information to impart about how Aaron Cross ended up being bioengineered, what it means, and why he has to go. Once the action does get going and Cross and his only hope of survival, Marta Shearing (Rachel Weisz) – the scientist who cooked up the magic pills – set off across the world, this falls into a familiarly Bourne-like pattern of foreign locations, rooftop chases, and Cross outwitting opponents with not just physical strength, but also cunning. As Jason Bourne himself is no part of the film, it’s never certain that Cross and Shearing will make it. Jettisoning its star has allowed the franchise to rediscover genuine thrills and suspense – particularly in the epic concluding action setpiece set in Manila.